Please accept my blessings. I am in due receipt of your letter dated 24th April, 1971 and have noted the contents. Also the newspaper article enclosed was very nice. Thank you for your decision. Please go on preaching and improve your Krishna Consciousness. There is no necessity of attending a university. We have got enough of a university educational program in our Krishna Consciousness movement. There are so many books to study and they have to be introduced also by preaching. So engage yourself in this way. If we have to spend time learning something, then where is the time for service? So utilize what talents you have already in Krishna's service and He will give you the intelligence to increase more and more. Please accept my blessings. I am in due receipt of your letter dated 18th May, 1971 and have noted the contents carefully. You will be glad to know that the two boys, Paul and Patrick, recommended by you have been duly initiated by me and their beads and letters are enclosed herewith. Their names are Purusa and Bhumna respectively. So far as your coming here to India, one thing to consider is that temple worship must go on nicely. That cannot suffer and if it is dependent on you, then you shouldn't come. For India, anyone can come; a newly initiated neophyte is all right. Experienced men like yourself are not required. So instead of you, find a newcomer; he can come. One thing though, is that I have noted with interest that you are proficient in the Russian language. If that is the case, then your service may be very much required, and so if I go to Russia at all in the near future, then I shall call for you and you shall accompany me to Moscow. For the time being, develop our Seattle center more and more and make it a grand success. That will be to your credit and Krishna will be pleased. So do it nicely. Two new boys have come just recently and as Krishna sees that you are sincere to push on this movement, so he will send you many more devotees. Please accept my blessings. I beg to acknowledge receipt of your letter dated 14th May, 1971 and have noted the contents carefully. Also I have seen the newspaper clippings enclosed and they are very nice. The devotees are looking so cheerful also. So I have named Paulin as Prafullamukhi Devi Dasi. Prafullamukhi means one who always has a cheerful face. Her beads and letter are enclosed herewith. I have received the check for $5. It is so much encouraging to note how nicely things are going on there in our newly developed Victoria center. Simply if you will depend on Krishna, He will help you more and more. I am also glad to note how nicely book distribution is going on there. Continue it and try to increase more and more. This book distribution program is so very much important. Also you should try and increase your programs at the schools and colleges and try to have a regular credited course at the University also. Your temple building seems to be very suitable. And the rent is very reasonable also. It is all Krishna's mercy. So take proper advantage and develop it nicely. If you can support yourselves by selling certain of your crops grown there, why not? And you can cultivate Tulasi devi also. Write Govinda Dasi in Hawaii in this regards. Your proposed asrama can be located anywhere, it doesn't matter. Just wherever you can attract most people. Person means not a dead stone. Person means all living entities. We cannot understand in our present material condition. An example is a stone in the spiritual world; if I ask it to move, it will move automatically. In the material world it will not. Universal form is a person also, and from that universal form so many things are appearing. Please accept my blessings. There has been a slight change of plans and I will not be arriving Bombay on 31st May, 1971. Rather my arrival there will be delayed for a few days. At the request of my Godbrother, Puri Maharaja, I have consented to go to Rajahmundry with party for a few days. I will be leaving Calcutta for Rajahmundry program on the evening of the 1st June, 1971 and will let you know by telegram when I am due to arrive in Bombay. The address in Rajahmundry is as follows: c/o B.V. Puri Maharaja; Sri Krishna Caitanya Ashram; Rajahmundry-1; E. Godavari (A.P.). Please offer my blessings to the others there. Please accept my blessings. I beg to acknowledge receipt of your letter dated 19th May, 1971 and have noted the contents carefully. Also I have received the enclosed checks for $500; ($200, $200, and $100) and also a check for $15. I am so glad to receive your father's money because this process will help your father to be delivered from the clutches of maya. Your father is fortunate enough to have a worthy child like you who is trying to force him to become Krishna Conscious by different ways. So both of you are blessed. 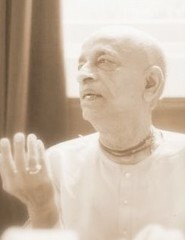 I wish that both you and your father be elevated to the highest standard of Krishna Consciousness. I have received also one note enclosed from Gaurasundara in which it is stated that Sai's beads were sent to Bombay. I am going to Bombay on the morning of the 31st May, so as soon as I reach there I shall send Sai's beads duly chanted on. In the mean time I am dispatching beads and letters, enclosed herewith for the three devotees recommended by you for initiation. So far you and your good husband's service is concerned, I am so much proud of you both. So far your health is concerned, your constitution is made like that but don't worry about it. Go on discharging your Krishna Conscious duties and Krishna will help you to live for a long time. Your service in the matter of implanting Tulasi seeds as introduced in the Western countries has proved it definitely that actually you are Govinda Dasi, maid-servant of Govinda. I always speak to many gentlemen how strenuously hard you work to have introduced Tulasi in the Western countries and I am hearing from everywhere that Tulasi is growing very luxuriantly. May Tulasi be kind upon you and introduce you to Krishna, to be one of the assistant maid-servant gopis in Vrindaban. I am sorry that Sadhana Dacca has not replied your letter. The next alternative is to write to the proprietor, Sri Baidyanath Ayurved Bhawan; P.O. Jhansi; U.P. ; INDIA. He is the right gentleman who can give you the right instruction and you can write him immediately. I am so glad to note that Sri Gaura-Nitai Deities are already finished. The color is molten gold or bright yellow resembling golden color but don't apply gold paint. The eyes should be nicely painted. You have got the idea; you have seen many pictures and I am seeing from here that you are doing nicely. From Bombay I may go to Russia (Moscow) and then to London and then N.Y. and then I will be coming to L.A. You will be glad to learn that we have purchased about five acres of land in Mayapur, the birthsite of Lord Caitanya and we have proposed to hold a nice festival there from Janmastami day for two weeks. At that time the foundation stone will be set down. I wish that all our leading disciples come to India at that time. There are 50 branches, so at least one from each branch should attend the function and Sai also may come at that time. From L.A. while coming to India I must come to Hawaii as I did last year and then after the foundation stone function I will come again back to U.S.A. The contemplation of sitting at Hawaii for my translating work is still alive. Now it depends on Krishna what I have to do in the future. Perhaps you know that we held a very big Hare Krishna Festival in Bombay and a similar one in Calcutta also. Daily both in Bombay and Calcutta there was attendance of 30,000 to 40,000 people daily. Everyone appreciated this festival and are still hankering after it. I think that similar festivals may be held in Hawaii. So consult with Gaurasundara and Sai because this attempt has become very successful. The jewelry offered to Lord Caitanya Mahaprabhu and Lord Nityananda should be very carefully set and kept in a secure place. There is no question of animal bone. As I have already told you, Ivory Jewels, conchshell and cow dung are all pure. Everything is pure when employed in the service of the Lord. Just like the mrdanga kohl is made of skin and still it is held as pure. If you want more karatalas and mrdangas, you can contact Jayapataka Swami here in Calcutta (3, Albert Road; Calcutta-17, INDIA). So coral and mother of pearl are all right. Many Deities are made of coral.